Rat infestations are extremely common, and are largely due to rats’ ability to move, reproduce, and survive better than most species of animal. If they aren’t sneaking in through openings to the outside, they can also find their way through the plumbing pipe highway as these critters are capable of squeezing through extremely narrow pipes and are excellent swimmers. Rat problems are extremely urgent issues, as they can quickly turn into huge infestations. Two rats are also capable of making over 6,000 babies before they die by the age of 2 or 3. These 6,000 babies, assuming they survive, will start breeding by the age of 3 months. To add a tinge of a horror story narrative to this, rats have also shown to develop a preference for human blood, and the most common bite time is between midnight and 8 AM. Life is too short to stay up at night worrying about these little critters, so let’s get down to business. Here’s how to do rat control like a boss. Although it’s fairly easy to identify a rat from any other animal, there is a substantial difference in how different types of rats act. The most common rats around the world are Roof Rats and Norway Rats. Roof Rats tend to have bigger ears and longer tails, pointed noses, and are surprisingly good at climbing. It’s not uncommon to see Roof Rats scurry up certain bushy trees for shelter. Appropriately named, these critters like to camp out in upper floors, attics, and outside shrubberies. Norway Rats, however, are more of the floor scurrying type of rats. They enjoy the lower parts of a building. Chances are if you’ve seen a rat in your kitchen or garage, it was most likely a Norway rat. Like the vast majority of creatures when provoked, rats can lash out aggressively to protect themselves. Getting bit by a rat isn’t a pleasant experience and requires medical attention. Rat bites, contrary to popular belief, aren’t likely to transmit the rabies virus to humans. Regardless, a bite-free human is a happy human so try not to corner these critters and grab at them. Rats are built to survive, and the distinction between what is “food” and what isn’t food can be very broad. This is why it’s imperative to make sure your spaces are extremely clean to get rid of the little feasting opportunities that keep rats coming back. For example, Sydney has actually experienced a rat rampage in recent months due to the rapid growth of new cafes, restaurants, and rental locations. There are plenty of opportunities for rats to get their feast on outside of your home, and they often seek to residential areas for an extra bite to eat or shelter. Keep your trash cans sealed, pantry food storage air-tight from invaders, and don’t leave food out. When it comes to rat control, rat traps are one of the oldest tricks in the books. Whether mechanically spring loaded or adhesive-based, these traps are very effective means to getting rid of rats. The traps also have the added benefit of knowing whether they are working because, well, if the trap has a dead rat in it, you’ve got it. Other pest control methods leave a degree of uncertainty, and a sudden disappearance of rats without evidence still leaves an uneasy thought in many people’s minds that they may someday return. In order to use rat traps successfully, however, you must first eliminate all sources of food for them. 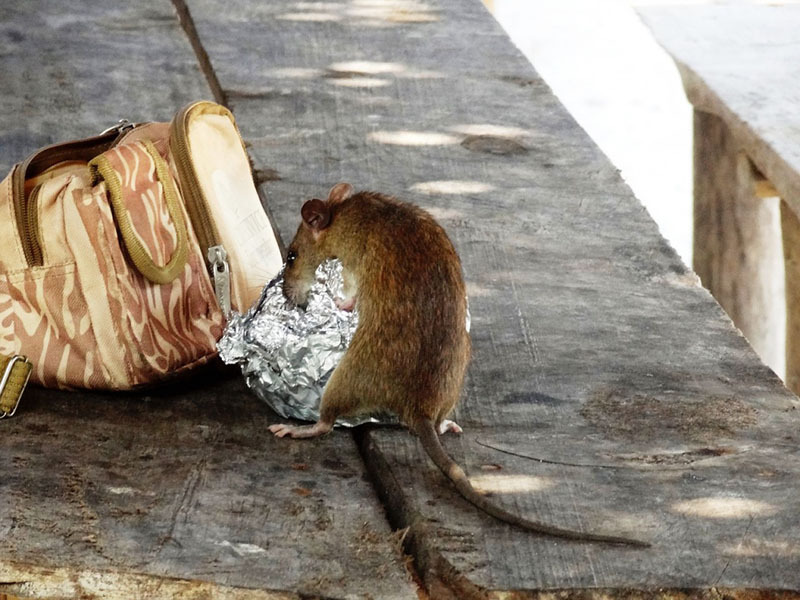 When rats find a source of food, they tend to prefer the safety and security of a guaranteed meal rather than explore new potentially dangerous options. You can also eliminate their sources to water by covering your drain covers, fixing leaky faucets, and reducing the amount of open water outside. As for the bait, rats are not particularly picky. Some of the foods they tend to prefer include bacon grease and peanut butter. While rat traps are an effective means of neutralising a rat and turning a live rat into a dead rat, the downside is that you now have to deal with getting rid of a dead rat. This task isn’t suited for those that are particularly easily nauseated for obvious reasons. If the dead rat isn’t found for a few days, it could produce a nightmare of an odour – especially in hot attics being battered by the sun all day. These traps also present a health risk to the handler. While they can work, poison traps aren’t as effective because rats tend to only try a little bit of a food to make sure it doesn’t make them sick before consuming it in potentially lethal doses. Hiring an expert in dealing with and removing pests can easily make your rat problems go away with limited interaction with the live or dead critters. Contacting a pest management expert is not only best for those anxiety-inducing moments of finding or hearing rats, but scheduling regular appointments can keep your house free and clear of the myriad of pests Mother Nature likes to throw into our homes. By following these tips, you will be able to control rats like a boss. While setting traps and hiring pest technicians are great steps in your rat control journey, it’s very important you take proactive measures to ensure rats aren’t coming back at any given time. Pest control is more than simply getting rid of pests, it’s about securing your peace of mind. You’ve got enough to worry about, seeing rats scurry from end to end across your kitchen or staying up at night listening to the orchestra of tiny footsteps in the attic is no way to relax.